Professional New Jersey deck cleaning contractors try to work in a way that's efficient and minimally disruptive to the homeowners' daily life. That's why they usually follow the same specific routine from start to finish on all their projects. So take a look at the process we use - it will help you get an idea of how your deck cleaning project will progress and what to expect when working with our company. The process starts when you first contact us to get your free estimate for deck cleaning. We then call you to get more details about the job, and for simple projects (like powerwashing vinyl decks) we will give you a quote right there on the phone. 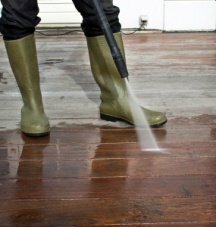 For pressure washing wood or fiberglass decks, we will need to see the job before giving you a quote. During your free appointment and consultation, we will inspect the condition of the surface, get clear about your needs and expectations, make recommendations and give you a verbal quote for pressure cleaning (and sealing, if required) your deck. If you decide to go ahead with the project, we will put together a written agreement that you need to sign (for your protection and peace of mind), and decide on the start date that works for you. You don't have to be present when we come to clean your deck. Just make sure that we will have access to your deck and water to do the job. See "How to Prepare for Powerwashing" for more details. On the start date (if the weather doesn't interfere with the plans, in which case we will let you know and re-schedule the job), our powerwasher will arrive at the determined time (usually at 8 a.m. ) with all the tools, supplies and equipment ready to do the work. They will set everything up, clear the deck of any furniture and decorations, and proceed with the power washing process, using just water or in combination with special cleaners (if required - to remove mildew, mold, or tannin stains from the wood). Once the work is finished, they will put back all the furniture and decorations as close to their original position as possible. If your contract included deck waterproofing, staining or painting, we will come back to finish the work as soon as the wood is completely dry (which takes at least 1 day, sometimes longer - depending on the weather and condition of the wood). We will keep you updated on the work progress and any change of plans. From start to finish, you will always know what is going on with your deck cleaning project, so you can make your own plans. And if you have more questions about our New Jersey deck cleaning service, take a look at these frequently asked questions.